Registration begins at 9:00am (Pre-registration recommended for large groups) and clinics and performances take place from 9:30am - 5:00pm. All Day of Percussion events will take place on the University of Montana campus in the Dennison Theatre. Yousif Sheronick has performed around the globe to critical acclaim, genre hopping with leading artists in the classical, world, jazz and rock music arenas. 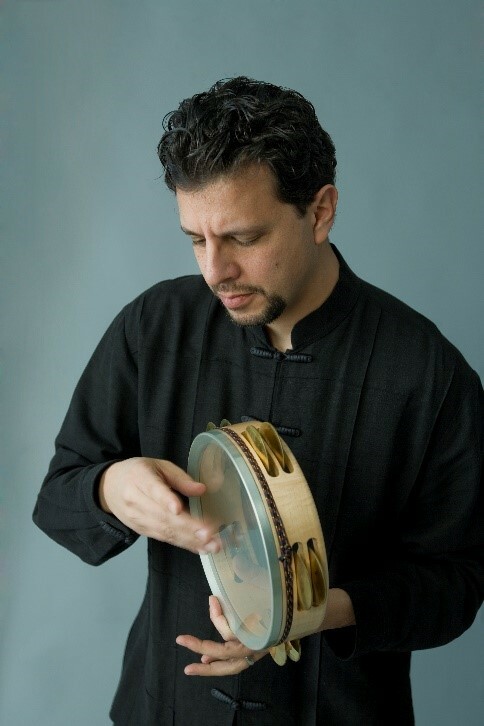 The New York Times hails Yousif for his “dazzling improvisations” and his “wizardry on a range of humble frame drums”. Of Lebanese descent, Yousif was recently featured in Drum! Magazine highlighting his versatility in an article titled “At The Corner Of The World”. His influences are far reaching as he grew up playing rock and roll drum set, studied classical percussion through a master’s degree at Yale University and went on to study music from Brazil, India, Africa and the Middle East. These combined influences propelled Yousif into performances with Philip Glass, Yo-Yo Ma, Lark Quartet, Ethos Percussion Group, Branford Marsalis, Sonny Fortune, Cindy Blackman Santana, Glen Velez and Paul Winter. His many musical influences are highlighted in duoJalal, his venture with violist and wife Kathryn Lockwood. A major force in bringing world percussion into contemporary/classical music, Yousif has had the luxury of working with composers Evan Ziporyn, Derek Bermel, Kenji Bunch, Lev “Ljova” Zhurbin and John Patitucci, all of whom were eager to compose for his exotic instruments. Critics say Yousif “is capable of creating hypnotic atmospheres” (Mundoclasico) where he “transported the listener to another dimension.” (Ritmic). As a composer and arranger, Yousif has contributed several solo and ensemble works resulting in performances of his music around the world. He has arranged several parts for his collaboration with the Lark Quartet including John Adams’ “Book of Alleged Dances” which was released on Bridge Records. In demand as an educator, Yousif teaches private lessons and classes at his home in New York and has conducted residencies and master classes at top universities including Manhattan School of Music, University of Michigan, University of Kentucky, the Queensland Conservatorium and National University in Australia. His producing credits include a solo CD and two instructional DVDs. “A testimony to his genius” raves Modern Drummer Magazine about Yousif’s CD Silk Thread, and Rhythm Magazine (UK) says Yousif’s Riq Instructional DVD “is a must to uncover the mysteries of this ancient instrument.” He has appeared throughout North and South America, Europe, Middle East, Asia and Australia with festival appearances including the JVC and Newport Jazz Festivals, Jazztel (Madrid), Renaissance Festival (Rethymno, Greece) Early Music Festival (Regensburg, Germany) and Jerusalem Festival (Palestine). Prestigious venue performances include Carnegie Hall, Lincoln Center, Hollywood Bowl, Royal Festival Hall (London) and Wigmore Hall (London). He has performed live on NPR’s “Performance Today” and John Schaffer’s “New Sounds.” Yousif holds degrees from Yale University and the University of Iowa. Yousif gratefully endorses products from Cooperman Drums, Sabian Cymbals, Innovative Mallets and Pearl/Adams. Dr. John Wooton is the director of percussion studies at The University of Southern Mississippi. A native of Lafayette, La., he plays steel pans for the Southern Miss Jazz Quintet and leads his professional steel band “Kaiso!” As an instructor and performer, John has been associated with five P.A.S.I.C. Marching Percussion Forum champions. He was associated with the Phantom Regiment Drum and Bugle Corps of Rockford, Ill. for 10 years as a performer, instructor and arranger. Over the past 20 years John has served as percussion consultant for various drum corps. Since joining the faculty at Southern Miss, Wooton has established a strong percussion studio, created and instructs the Southern Miss Steel Pan Orchestra, Pop Percussion Ensemble, Samba Band and Salsa Band. He has served as the president of the Percussion Arts Society, Mississippi Chapter, and served as a member of the Percussive Arts Society Marching Committee from 1990 to 2012. Dr. Wooton is a clinician for Pearl Drums, Sabian Cymbals, Vic Firth Sticks, Remo Drum Heads, and Row Loff Publications. He is member of the Vic Firth Education Team and is featured demonstrating all 40 snare drum rudiments on the Vic Firth Web site at www.vicfirth.com. Recently John has performed clinics and concerts in Colombia, Serbia, Poland, Italy, Austria, England, China, Germany, Argentina, Brazil, Puerto Rico, Peru, Mexico, Costa Rica,Trinidad, Canada and the Percussive Arts Society International Convention. Within the United States John has given clinics, recitals and concerts in all but two states. He has authored two books and numerous rudimental snare drum solos and marching percussion ensemble pieces. Most recently, his book “Dr. Throwdown’s Rudimental Remedies” consists of a two hour DVD, 951 play along tracks and 25 lessons. “The Drummer’s Rudimental Reference Book” is a staple amongst universities throughout the U.S. and abroad. About Dr. Wooton’s Rudimental Reference Book, Thomas L. Davis said “Perhaps the most definitive rudimental technique book of our time.” These books and several of Dr. Wooton’s other compositions and videos are published by Row Loff Productions at http://www.rowloff.com. For more information about Dr. Wooton, including videos, publications, downloads and much more, go to http://www.johnwooton.com. From Los Angeles, Chris Wabich is known as a versatile and original voice on the drumset. The variety of artists he woks with reflects his diversity as both musician and producer. His drumming is heard with Ludacris, Sting, Leonard Cohen, Stanley Jordan, Brian Johnson (AC/DC). Sheila E., Mark Murphy, the Zappa Family, Larry Koonse, Turkish superstar Omar Faruk, Boogsie Sharpe, Prog-rock legends Kevin Ayers (Soft Machine), Mike Hoffman (Tony Williams Lifetime), and  Richard Sinclair (Caravan). A few soundtrack he's performed on include "Malcolm in the Middle," "American Idol," "Better Homes and Gardens" and IMAX's "Wild California." 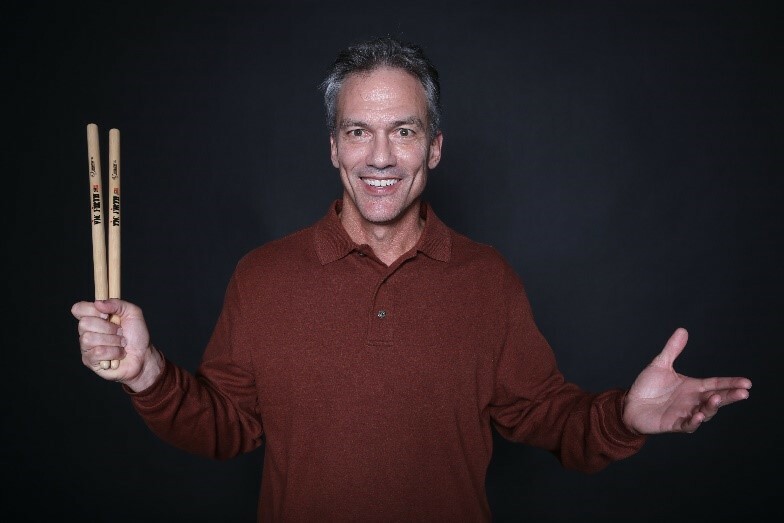 More recently, Chris has been arranging and producing projects including Billboard charting hits for Margo Rey/John Oats (of Hall and Oats), Ty Taylor from Vintage Trouble, and the Beatles show, "Both". 2016 launches a new CD of Chris' quintet, "Thelonious Monkey" followed by a series of intense production and songwriting for winning artists from "American Idol", "The Voice" and "So You Think You Can Dance".